Due to lack of snow in the Cascades, we have been back out to the woods earlier than usual this year. It feels like April–patches of snow and ice in low shady places, the sound of water rushing in the creeks, air that feels warm in the sun and chilly when the wind blows. We have seen sagebrush buttercups blooming and coyotes hunting mice in fields of last year’s dry grass. There are few people out during the week, so the forest feels expansive and barely occupied. We see things we might take for granted when the woods are busier. Driving past cutbanks on Taneum Road, Jon slowed down so that I could look out for fossils. I asked, why not stop for a few minutes? So we did. Immediately our eyes snagged on the shapes of leaves etched into rock. The impression of a huge fan palm radiated on a golden slab of sandstone. 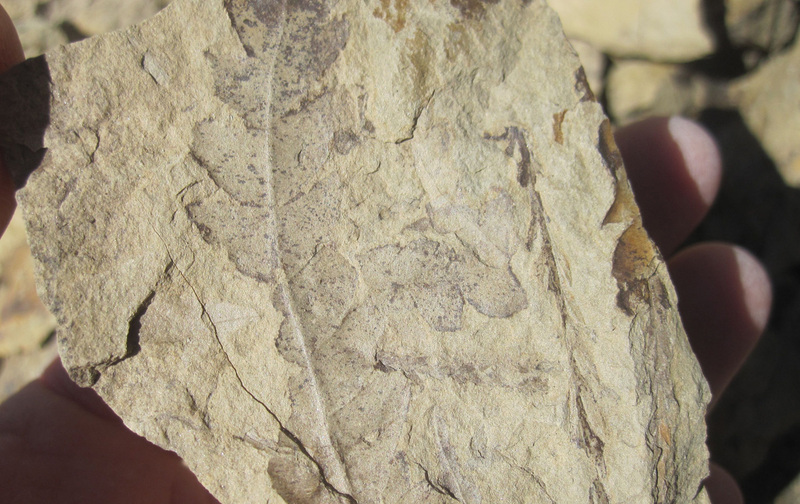 I found lance-shaped willow leaves pressed into mudstone, and he found something that might have been a poplar. We both saw numerous long slim reed shapes. Once a person starts looking and turning over rocks, the hunt is on. There is the anticipation of discovery, followed by the mind-boggling realization that these impressions are evidence that this place used to be quite different. Warmer, for certain–no fan palms grow here now. Where the Cascades now rise was once a low coastal plain along the edge of North America. This was during the Eocene (20-40 million years ago). Imagine the lush growth of hardwood trees and swamp plants like ferns and mosses and reeds. Imagine the leaves falling into shallow still water and then an influx of sediment. Imagine this going on for a long long time, layer upon layer. Then imagine micro-continents crashing into North America from the west and joining their rocks with the existing ones. Imagine all the crashing causing pressure and folding, with the land rising and falling, volcanoes erupting and all sorts of geological mayhem. Throw in some Ice Ages and big floods of both water and lava, and pretty soon you have the land that we know as Washington State. Rocks that were once on that coastal plain are now exposed along a road cut in the mountains, and leaves that grew and fell into the water millions of years ago are visible to the curious eyes of wayward forestry technicians. In this strange winter of no snow and all the apprehension it causes–is this what global climate change looks like?–I am reminded that the planet has changed in big ways before. This might be the first time such changes have been anthropogenic (or not), but the Earth is old and has been through some upheavals prior to the current one. It puts the concerns of my pipsqueak little life into perspective. I find that oddly comforting. Arlene, I can see you on that snowpack. We carry memories of the changing world, for sure. Thanks for reading, still.